The D51s were the last passenger tank locomotives designed by Drummond for the North British Railway (NBR). A total of thirty locomotives were built in five batches between 1880 and 1884, including a final batch of six built by Reid. 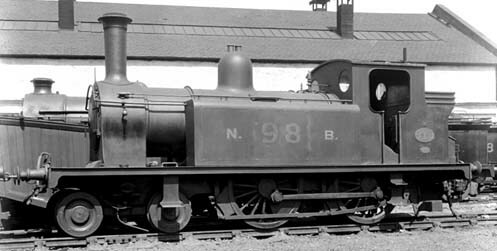 Between 1908 and 1911, Reid fitted new boilers of the type he had already fitted to the Drummond J82 0-6-0T locomotives. The D51 tanks were mainly used on the suburban services around Edinburgh and Glasgow, and on the various NBR branch lines. Early on, these also sometimes operated mainline stopping services. Nos. 10456, 10458, 10461, and 10462 were fitted with cowcatchers at both ends when working the Fraserburgh to St. Combs branch. Withdrawals started at Grouping in 1923, and the last three D51s were withdrawn in 1933. The following details describe the D51s as they entered LNER ownership, with the Reid boilers. Heating Surface: Total: 666.06 sq.ft. The last three D51s were withdrawn in 1932 and none survived into preservation. London Road Models sell an etched 4mm scale (OO gauge) kit of the D51. Thank you to the Mike Morant Collection for the photograph of NBR No. 98.